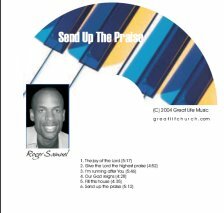 Send Up The Praise (Pre-Release) Is a 6 song pre-release CD. It's a celebration of praise with a fresh new sound and lots of energy. This CD will get your feet a dancing, and stir you to press deeper into His presence. The final 12 song CD is on the way so stay tuned for more information. 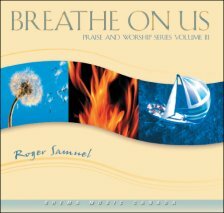 Breathe On Us brings a fresh new worship experience with 13 new songs from Music Minister Roger Samuel. Even as God breathed the breath of life into Adam and he came alive, so may the breath of God breathe on us that we too may come alive in Him, and be renewed by His abiding presence. As you listen to this CD, our prayer is that the presence and breath of God would come fresh and anew in your heart and life. Rhema Praise 2 is the second installment of the Rhema Praise, praise and worship series. Rhema Praise 2 is a dynamic expression of praise and worship from Music Minister Roger Samuel. This compilation of praise and worship songs is geared towards people and churches that have a passion for the presence of the Lord. As you listen to this CD, we trust you will be blessed and re-assured that Jesus Christ is your strong tower, and a present help in time trouble. I Will Sing is the first in a planned series of praise and worship CD's. It has taken a while but it's finally here! My heart is filled with excitement for what the Lord is going to do thought this project. There are many great Christian artists out there today, each with their own direction and minstry focus. We trust that our music will provide encouragement to all listners. There is an abiding presence that God wants us to establish with Him. He does not want us to just come and go as is our weekly custom. Rather, He wants us to experience His abiding presence. We're aalways looking forward to hearing from you. Click here to contact us.